Automated Cash Income System Reviews - Legit or Scam? Automated Cash Income System Reviews – Legit or Scam? 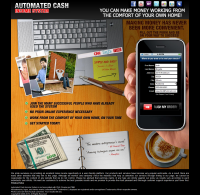 Automated Cash Income System (www.MyIncomeConnection.com) is a new face for an old scam. This website is selling a kit called the Automated Cash Income System, which is described as a convenient, work from home system, that you can do successfully with no experience. These vague “no experience necessary” kits are notorious in the work at home business community for being a scam. A simple internet search will show you that hundreds, if not thousands of people have been burned by these kit companies. There are so many complaints against these types of kits because the companies running them use very shady billing practices. They offer the program as a Free Trial, with minimal charges for processing, but as soon as they get your credit card details they quickly hit you with a much larger charge. The Automated Cash Income System actually charges a less outrageous fee than many other kit companies at $29.95 a month, but that doesn’t change the fact that these charges are non-refundable so you’re taking a chance signing up for the 5 day trial. So can you make money with The Automated Cash Income System? This is hard to say because Automated Cash Income System gives you exactly zero idea of what it is you will be doing to make money. Internet marketing, network marketing, ad placing, auction listing… You could be expected to sell people treasure maps to the leprechaun’s gold for all the information available from the Automated Cash Income System! I cannot emphasize enough how dangerous it is to give your credit card to a company who is giving you no information on what you will be receiving in return. In addition to no information about the actual work opportunity, there is also no email address or phone number to call if you have problems or to confirm a cancellation. If these guys really did have a product that could teach you how to make money online then they wouldn’t have to use deceptive billing and false advertising to get customers. Automated Cash Income System ? Average Rating for " Automated Cash Income System " is 0 out of 5 based on reviews. Thank you for review I gave them my email address at yahoo which I'm using in case when I'm not sure about website. So thank good I don't have to sort any emails at all. It is just unbelieved how far scamers can go. How it is possible to use icons like Google Yahoo eBay on this scams? Can't they just shut down those web pages? Now I have to watch my credit card. so if you gave them your email already what do you do to fix it? So did not see this until AFTER I clicked on the website and gave an email (STUPID!!!) now I am going to have to monitor my email like a hawk!!!! How then can it be corrected? It appears this outfit has now resorted to mass identity theft. I received an email from a friend that his email contact list has been hacked and is being used to send emails under his name which he has not sent. I checked my SENT folder to find out that I had been infected with the same problem. Emails were being sent to all my contacts from my account under my name highly recommending to buy services from "Automated Cash Income System". Subsequently, also found out that people on my contact list were also infected with the same identity theft and their emails were being used to reach their contacts with flattering recommendations to do business with "Automated Cash Income System". These emails have no subject except RE:. MICHELLE on PostalExam473.com Reviews – Legit or Scam?